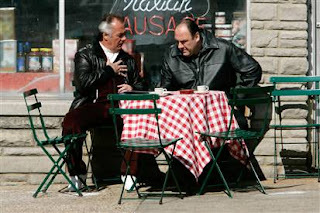 The acclaimed HBO series, The Sopranos, frequently captures the sentimentality of Mafia members. It portrays Tony Soprano and his cruel cronies weeping about their mothers, sniffling at old movies, idealizing their children, lamenting the loss of tradition and being fiercely protective of their wives (on whom they systematically cheat with their "goombahs," ie. mistresses). That "i.e" is missing a period and, as Grammar Girl has helpfully determined, five out of six style guides recommend a comma following its deployment. But never mind that for now. More importantly, "goombah," as any mob-follower worth his pomade knows, refers to male friends--paisans--and, more loosely, to mobsters in general. The feminine version, used to describe the "kept women" they keep, is "goomah." First may I once again thank the many people who visited this site to express condolences on the death of my late brother, Christopher. But of course, late, in this context, means dead; it seems oddly redundant to speak of a dead person dying. As Christopher Hitchens never tired of pointing out, you get only one life. And that includes only one death.